This pie. Crazy freaking good. Ken’s birthday was last week. He likes ice cream. A lot. He also likes carrot cake but this post isn’t about carrot cake, it’s about ice cream. 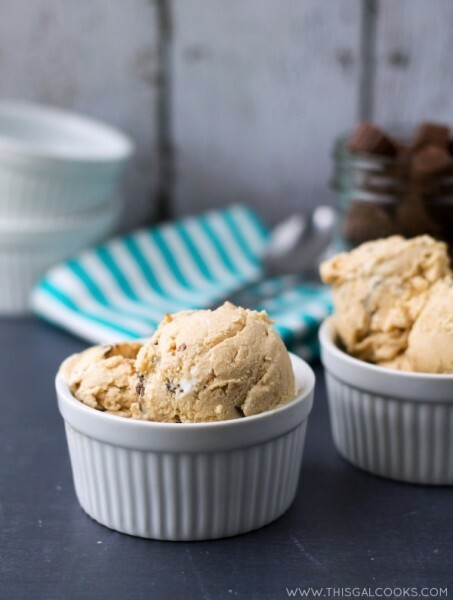 So we’re gonna talk about ice cream today and we’ll talk about carrot cake another time. Once day I was walking around the grocery store and I get this text message from Ken: “Cold Stone Birthday Cake Explosion Ice Cream.” No joke, that’s all the text message said. Of course, after I replied with a “what are you talking about?”, I didn’t get a response. But I figured he wanted birthday cake ice cream. And I wasn’t going to head over to Cold Stone. After all, I was in the middle of grocery shopping. And our grocery store just happens to have a mad selection of ice cream, including birthday cake ice cream. So I picked up a carton of birthday cake ice cream and went on my way. Ken was happy. I think he dug into that carton shortly after I got home. It may or may not have made it into our freezer before he got himself a big ole bowl of it. Fast forward a couple weeks and you have Ken’s birthday. I made him these crazy good carrot cake bars by Averie Cooks but the real highlight of the day was the ice cream pie. For some reason, my sweet tooth has gone into full fledge GIVE ME NOW mode. On this particular ice cream pie making weekend, I picked up a package of mini Twix, a jar of salted caramel sauce and an organic version of OREO cookies from the grocery store. The organic OREO-ish cookies didn’t go into this ice cream pie but I threw them in that list to give you an idea of how crazy for sweets I’ve been lately. 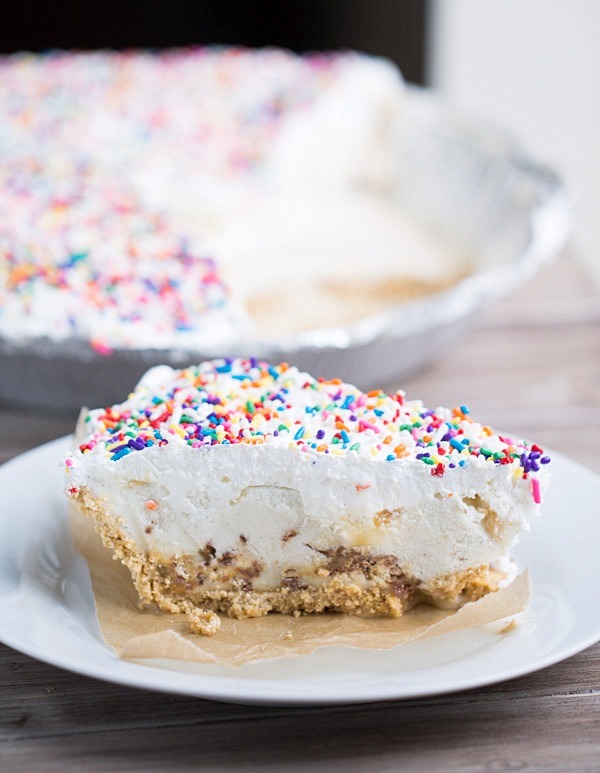 A while back I saw this Chocolate Candy Bar Ice Cream Pie by Chocolate Chocolate and More and I was like WHOA! I gotta make that! Or something like that. Ken isn’t into chocolate ice cream so I made a pie with vanilla ice cream. Vanilla ice cream, Twix and salted caramel sauce. Twix Ice Cream Pie. I bet you’re starting to drool right about now, aren’t you? Set the ice cream out on the counter until has softened and is easy to stir. Pour into a bowl and then mix in the chopped Twix bites. Drizzle the bottom of the pie crust with 1 tbsp of the salted caramel sauce. Pour half of the ice cream mixture into the crust and then drizzle with 1 tbsp of caramel sauce. Pour the remaining ice cream mixture into the pie crust and then drizzle with the remaining caramel sauce. Place in the freezer for 10-20 minutes. Remove from the freezer and carefully top with the cool whip. Top with sprinkles and then return to the freezer and let freeze for 4-5 hours. Serve and you shall receive smiles. "Cook time" is actually freeze time. While the freeze time is 5 hours, the time spent prepping this recipe is only about 10 minutes! Julie this looks so good! I love Twix. And of course I love ice cream too so this is just perfection. Plus how can I deny anything with sprinkles?! Pinning! This looks crazy delicious and good Julie!! I’m sure Ken enjoyed it!! Pinned to make for Mr J!! He sure did, Zainab! We still have some left so he’s still enjoying it, along with all of the other sweets I’ve been making lately. LOL! Wow, Julie! This cake does look incredible! And so perfect for a birthday! He sure did love it, Kelly! Thanks so much for stopping by. Hope you have a great week. And thanks for the pin, too! La la la la … I’m not listening!!!!! I am on a mission in July to lose a few lbs and holy (birthday) cow this looks good. And one of my fave candy bars too?? Lalalalalaaaaa – pinning for later and shutting out this “evil” for a few more weeks. Thank you. Have a Great Day and Week! You’re welcome, Liz! Thanks so much for stopping by! 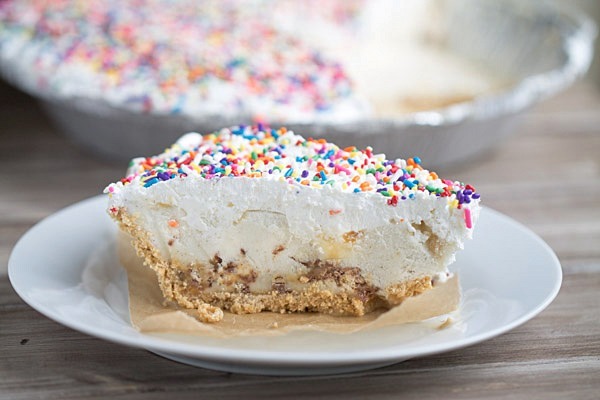 Oh yeah, you totally need to try an ice cream pie, stat! They are so super easy to make! You know, my birthday is coming up. And I think texts with only ice cream names is a good hint hint. ;) Twix and caramel sauce with ice cream, now THAT is the way to do ice cream pie! And hooray for birthday sprinkles! Pinned! Mmmmmm who needs Cold Stone when you have THIS?! I REALLY wish I had a slice of this ice cream pie right now! Not only am I an ice cream fanatic but Twix is my favorite candy. 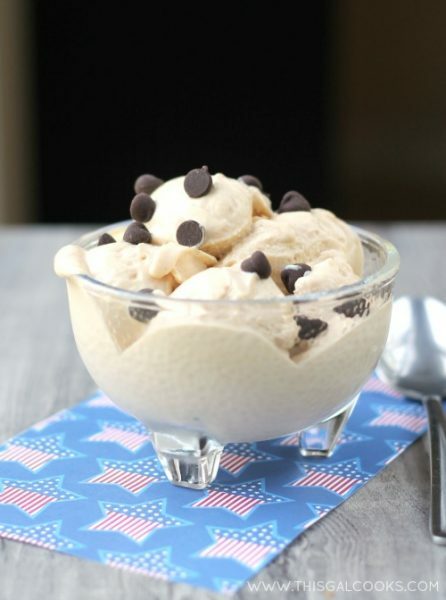 It’s so hot right now and this would be the perfect treat to cool me off, love it! 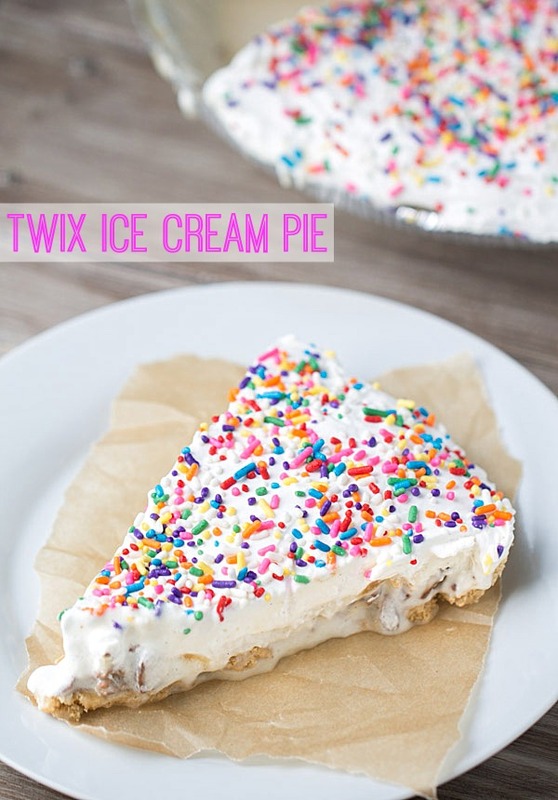 This pie just sounds like all kinds of awesomeness! Twix is the candy bar I sneak into my grocery cart in the check out line, eat in the car on the way home and then throw out the wrapper so I don’t have to tell my son why I didn’t share with him! Ha! Love that stuff. 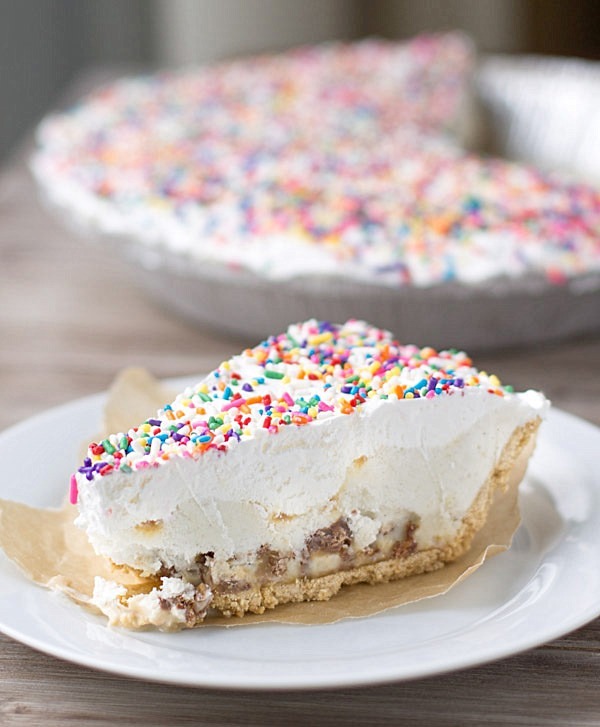 This pie would be my choice for a birthday celebration or just any old day too. It’s a beauty! Thank you, Holly! I just so happened to have indulged in a Twix bar today. Mmm. So good! this looks like a fun dessert! 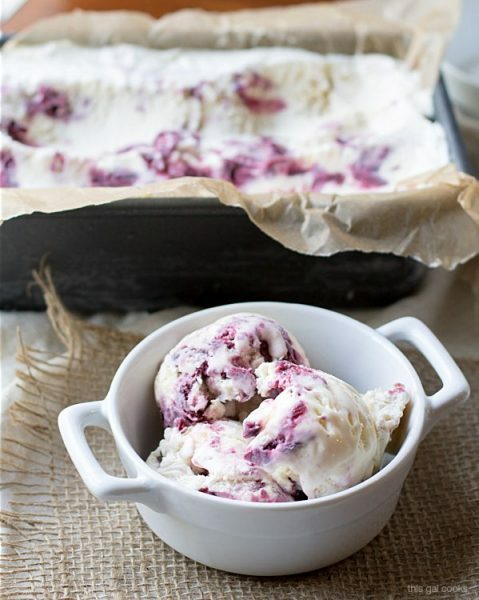 Pingback: Great Ideas -- 25 Popsicles & Ice Cream Recipes (Part 2)! This looks amazing, thanks for posting this up. I have had this recipe bookmarked forever, and I finally made it. Yum! My entire family loved it. It is pretty easy to put together, unless you use homemade ingredients (ice cream, graham cracker crust, and caramel sauce) like I did I used Twix fun size bars (about 10) because I didn’t have the bites. Thanks for a terrific recipe! Pingback: #اعرف_أكثر: تحب التويكس؟ تعرّف على ١٧ طريقة مبتكرة للاستمتاع بأكله! | اعرف أكثر!